Today’s Geriatric Medicine (TGM) eagerly anticipates the launch of its new online monthly column, “Geriatrics Consult With Rosemary Laird, MD.” From her years of experience as an accomplished geriatrician, Dr. Laird will utilize her column as a forum to offer busy providers valuable pearls and updates focusing on the treatment and care of older adults and the unique inherent challenges associated with the medical care of this vulnerable population. 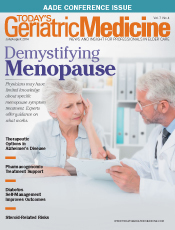 Visit our website in August for the inaugural column, and submit your geriatrics-related questions to TGMeditor@gvpub.com for consideration for an upcoming column. The following Q & A with Dr. Laird provides an initial introduction, including insight into her professional expertise, and the catalyst that sparked her interest in sharing her knowledge and practice tips with other providers. TGM: What has been your professional experience in treating older adults? Laird: I have been a fellowship-trained and board certified geriatrician since 1995. Through my training, I’ve learned a great deal about how each organ and body system ages and how illness impacts the aging body. Aging is a complicated process. My main clinical work has been as an outpatient geriatric specialist caring for patients with what I call “complicated frailty.” Most often this means they have multiple problems, including memory loss and other common conditions of aging, such as falls, urinary incontinence, weight loss, and polypharmacy. As geriatricians, we’re trained from our earliest days to realize that caring for the elderly takes a village. Even a geriatrician can’t go it alone. In medical settings, it takes working with a care team, including registered nurses; social workers; physical, occupational, and speech therapists; case/care managers; and pharmacists. And don’t forget the most often overlooked team members, the family caregivers. I’ve come to understand that I can’t fully care for my older patients without carefully and directly supporting their family caregivers. TGM: What’s the origin of the concept of the column? Laird: As a specialist geriatrician, I see patients who are referred by their primary care providers. As I talk through the issues with patients and their caregivers and we assemble care plans, sometimes the problem list can grow and grow and grow. Or a problem is so complicated that it takes the full time of a visit just to understand its multiple aspects. That’s where a geriatrics consultation is really valuable. For today’s busy providers, “Geriatrics Consult With Rosemary Laird, MD,” is here to help. Even the most caring and dedicated primary care providers would never, during a typical office visit, be able to address each and every one of the issues facing patients and caregivers. As a geriatrician, I may not be able to turn back the hands of time or cure certain diseases, but I can offer quality pieces of information about how the body ages, the common afflictions that often accompany aging, and how we can adapt or comfort, making patients healthier when possible, happier always, and relieving stress and burden on family caregivers along the way. TGM: What’s your vision of presenting provider information and support? Laird: One focus will be to support primary care providers who are seeing an ever-growing number of older adults. They all want to do well by their older patients, but the range of needs often pushes up against the limits of the time they have to give patients. I want to create a column that provides high quality practical information about common challenges faced by older adults and their family caregivers. The information will be highly practical for providers and will include highly practical information they can pass along to family care providers, too. TGM: What are some subject areas that providers can anticipate will be addressed? Laird: The common “Geriatric Syndromes” will be a focus. These include memory loss, falls, urinary incontinence, and weight loss/failure to thrive. It’s equally important to explore the “Experience of Aging” because when we understand how the body changes as it ages, we often are better prepared to adapt to the changes. “Family Caregiving 101” will share practical advice boiled down to the key points that a busy, stressed caregiver can learn in 101 seconds. An equally busy primary care provider can offer these materials to caregivers and help lift the caregiving burden a bit. “News You Can Use” will incorporate information from the world of medical research, translated from the academic to the practical for the benefit of busy providers and family caregivers. “Navigating Health Care” will offer tips for managing the journey through the maze of what we call the modern American health care system. It’s truly the best in the world if patients can find their way to the right provider in the right office at the right time. Finding the right provider is vital for the elderly since not every practitioner is focusing on caring for the elderly with the special treatment they require and deserve. TGM: Will there be opportunities to ask questions, suggest topics, or offer comments? Laird: Yes. I want the column to be the go-to resource for busy, compassionate providers who want to provide quality care to older adults along with support for their caregivers. Tell us what you wish you could do for your patients and/or their caregivers. What mistakes or problem areas do you see patients or family caregivers facing again and again? If you have an idea for a handout you need, let us know because, most likely, others could use it as well. Is there something you’ve wanted to find an answer to? Are your patients or their families asking questions about something you haven’t heard about? Let us do the searching for you. TGM: Will there be other contributors/authors? Laird: Yes. Over the past 30 years, there has been a tremendous effort under way to train medical professionals across many disciplines to be experts in aging. I’m the product of this training and know of many other talented individuals to whom I will reach out as I seek information that will help readers help their patients and caregivers. TGM: How will the column topics be applicable to clinical practice, long term care providers, etc? Laird: The training and staff development that has occurred over the past three decades wasn’t limited to physicians in the office setting. The nursing home community has made great strides over that same time, and now completely new types of care settings, such as assisted living and home care programs, are becoming more popular and available. Much of the information will be applicable to older adults across the care settings, while some will be site specific or will identify resources for specific clinical settings. The online column “Geriatrics Consult With Rosemary Laird, MD,” will appear on our website at www.TodaysGeriatricMedicine.com/consult beginning in August. A new column will be posted each month, with some special posts in between, so check back often. Today’s Geriatric Medicine’s monthly e-newsletters will include a link to the column as well.